A member of the Southampton team who won the first Women's FA Cup in 1971 is hoping to find the missing trophy for the National Football Museum. The trophy is thought to have been lost in the late 1970s, with a new version introduced for later competitions. 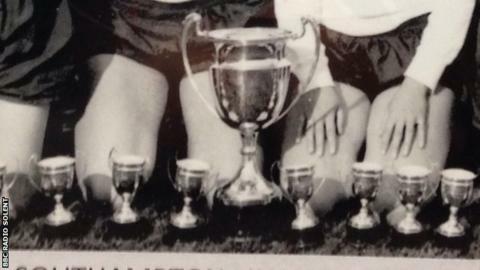 Sue Lopez was in the side which beat Scottish club Stewarton & Thistle 4-1 to win the-then Mitre Challenge Trophy. "We think a player tucked it away somewhere in a trophy cabinet," former forward Lopez told BBC Radio Solent. "We hope it's still around. I'm on a mission for the National Football Museum to try and find the original so that the museum can have it." Southampton won eight of the first 11 Women's FA Cup finals, but it is not known whether the trophy is with one of the Saints players. In 1895, the men's FA Cup was stolen from a shop display in Birmingham. The trophy was never recovered, and a replica had to be made. The Jules Rimet Trophy, awarded to the winner of the World Cup, was stolen prior to the tournament in 1966 and eventually found by a dog, Pickles. It was stolen again in 1983 and never recovered. In 2000, PSV Eindhoven's 1978 UEFA Cup trophy was stolen by a Dutch internet prankster. It was returned a year later. Last year, 60 trophies were stolen from F1 team Red Bull. 20 of the trophies were eventually found at the bottom of a lake. This year's final, which takes place on Saturday, is between Chelsea and Notts County at Wembley and the winner will be presented with the third iteration of the Cup, which has been used since 1998. "During the days of the Women's Football Association (1969-1993) we had a couple of Cups which were awarded to the winner of the WFA Cup competition," said Patricia Gregory, a former WFA secretary. "The first competition was sponsored by Mitre Sports and the Cup was awarded for the first time in May 1971. "It would be good to establish the whereabouts of that trophy as it is part of the history of the game which has seen so much progress in the last 50 years."